LONDON: Several exhibitors, delegates and sponsors across many countries have shown a great interest in taking part in the 7th Annual Gulf Education Conference and Exhibition scheduled to be held in Jeddah, Saudi Arabia on 20-21st February 2018. 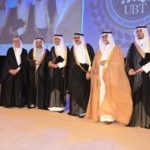 The University of Business and Technology (UBT), Jeddah is hosting the event wherein over 150 exhibitors and sponsors including some big names in the education sector have expected to participate. ST George’s University will be sponsoring the gala dinner on both the days. Besides several dignitaries, Dr. Ahmed Al-Eissa, Minister of Education, Kingdom of Saudi Arabia, is expected to speak at the conference. Dean of Admissions, St George’s University, Mr. Bob Ryan would be personally meeting the delegates to introduce its first class medical program.